#422 Mate's Quarters: Waterfront w/Water-views! Boat Dock; Dog Friendly; large condo. Walk into our historic waterfront condo and you'll smell sea air and feel sea breezes. Upstairs are two bedrooms; one with a Queen bed and the other with a Queen and Twin bed. The deck is perfect for all family meals. Fish or boat directly off our shared dock! Beautiful sunrise over water! 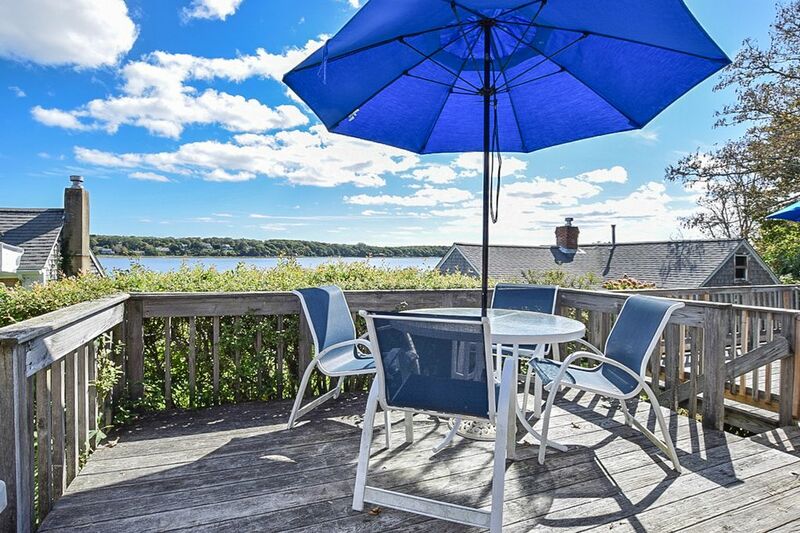 This home is perfectly located on the Nauset cove and estuary. The front-deck is where you'll enjoy all your time watching boats in the bay, birds and beautiful sunrises and sunsets. Inside you'll find a well equipped kitchen, two bedrooms, a queen bed in one and 2-twins in the other, a gas fireplace in the living room and an updated bathroom. Stay cool and connected with A/C units in both bedrooms and wifi and cable to enjoy on your flat screen TV. Please note, this home shares a wall with another condo/apartment on the property. Anchorage on the Cove by Del Mar Vacations offers a full vacation experience in one place. Put your boat in at Town Cove and pick up your guests for a day trip to anywhere! Enjoy use of our kayaks, canoe or skiff or bring your paddleboard or fishing poles to explore the area. We are centrally located near shopping, bay and ocean beaches, bike trails, art galleries, theatres, great restaurants, and the Cape Cod Institute and Cape Cod Symposia. Large Families Take Note! This unit is on a property with 3 other cottages and 2 condos that are also available. The entire property sleeps 24 and is fantastic for a large family; offering plenty of open space as well as private space if needed. Pets are always welcome on leash and even have their own dog run on the property(just make sure to supervise and clean up after). Our waterfront accommodations are open year round, and our cottages are available on a weekly basis “in season” from Saturday to Saturday and off-season, we offer a two-night minimum. -Dogs w/approval and fee paid. On-leash at all times. Crated when left alone. Beautiful view and location, but the home was misrepresented in the photos. While it is cozy, it is smaller and more run down then the pictures represent. The steep narrow staircase to the upstairs bedrooms should have been made apparant as they could present a problem to renters who cannot climb them. Over priced! AMAZING views! Had a lovely stay! We were very impressed with the property, and views are just spectacular. Everything was great, from the cleanliness to the responsiveness of Del Mar Vacations. While the weather was cold that time of year, the unit was well heated and seemed to be taken very good care of. Thank you for a wonderful stay! Thank you for your kind review. We take pride in caring for these homes and we are so glad it shows! Our accommodations got changed due to a heating issue and then we had to move again to accommodate a scheduling issue. Both places were very nice,maybe even better, with great views and we had a great time inspite of the inconvenience of moving. The managers worked with us to accommodate us. Thank you. Thank you Jim & Jan! Thank you for being understanding guests and allowing us to get you into a comfortable place. Come again soon and use your $100 coupon towards your next trip out! Difficult to find, from highway passed it more than 4 times from Route 6, a dangerous highway, and experienced difficulty finding the unit. Staircase to bedrooms was unbelievable, steep, narrow, with a hairpin turn glad we weren't Disabled. Pictures on brochure and website were probably stage. It was neat and clean and the bedrooms and linens were great. We have used VRBO many times throughout New England, this was a disappointment. I'm truly very sorry that you were disappointed with our rental. We rarely receive complaints, since this is pet-friendly and spacious unit in Eastham which overlooks the water. Our team is available 24/7 to answer guest questions, so had you called, we would have been able to help you find the unit by letting you know to look for the large sign "Anchorage on the Cove". You are absolutely correct that this home may not a good choice for some disabled people, as all of the bedrooms are on the second floor. Thank you for staying and supporting small business! This has been our 9th rental on the Cape in a out 7 years and we enjoyed our time there. The bedrooms were especially inviting, clean, spacious and well appointed. The living area on the first floor was small but adequate for five or so people. However, the quarters there were a bit tired and outdated, most notably, the kitchen had no dishwasher. Most disappointing of all, however was the hedges by the deck railing had been allowed to grow over a foot above the top of the ceiling, thereby blocking the ocean view. Overall my family had a great visit to the Anchorage Cove and the maintenance staff and owner were extremely friendly and responsive to issues such; clogged toilet, malfunctioning heating, The hedge over the back deck was over growth and obstructed the view to the water and needed to be trimmed. Since we visited at the very beginning of the summer season, the pier for the canoes and kayaks was not ready and made it very difficult to launch them into the water.